The Authoress: Well lookie here! Suzanne Collins gives us a holiday surprise! Well lookie here! Suzanne Collins gives us a holiday surprise! I was scrolling through my Goodreads coming-soon shelf and found an unfamiliar picture and title. New words had taken over what had before been "The Hunger Games #3". They now said, "Mockingjay" with a fancy blue cover to accompany it. That's right, ladies and gentlemen! 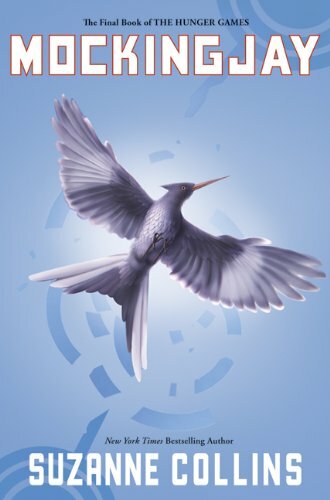 There is now a cover and title for Suzanne Collin's third book in the Hunger Games trilogy. My opinion: I must say that I love this cover the most. It doesn't hold a depressing note like the first two did. This one looks hopeful and the bird looks joyful, free. I think it might be a sign to what to look for in the book. I love the title as well. I loved the story behind the mockingjay's that was told in the first book. And it's Katniss's symbol, as well as the symbol for freedom. Book arrives August 24th, 2010. Everyone mark your calendars! Hex Hall is bout to blow the roof!